Woo Hoo, snow! I didn't think I was going to see any snow until next winter and this morning we got a couple of inches of snow when I headed out at about 6:30 AM and it was still snowing. I rode over to Upper Paugussett State Forest, and headed in from the Echo Valley Lot. The Poly Brody was pretty sloppy for the first 100 yards but then got better. Climbing up the back side of the hill was no problem with these big meats and running 20 psi there was absolutely no issue with traction. The Gussy was really smooth in the snow. This time I remembered to unlock the fork but it almost seemed like it wasn't needed. No one has done anything with the blowdown yet. If someone does bring in a chainsaw I hope they cut the top piece because the larger part of the trunk would make a real nice skinny. I rode all the way down to the Jeep Trail and then came back up the Gussy. 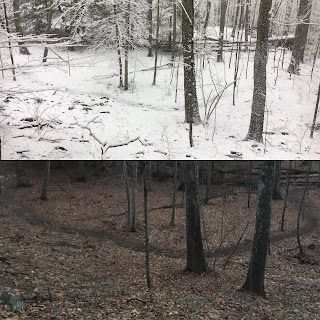 I stopped at the same vantage point on the Unmarked and Unsanctioned Trail and took a picture so I could compare it to the one that I took the other day of the Gussy. I purposefully stayed off the Upper Mulikin because after the rain earlier this week and today's wet snow it's going to be really sloppy. I noticed some people had ridden it the previous evening and I am trying to get the word out. I might have to make some closure signs. Coming back down the mountain I took the Mr Ed Trail but stopped at this Widow Maker to make a bit of a go around and open a nice little roller on the side of the trail. Mr Ed turns into the Purple Nurple Trail which then runs into the Lower Mulikin trail which I followed almost all the way down. Right before the blue trail my eye caught a line of the Old Jalopy Trail that I rode last week so I took it. It's not marked and the only way you will know it's there is if you can still make out my tire tracks. This is my snowshoe route that I like to take when the snow is a lot deeper and it makes a great by pass of the blue trail. If you want to see an interactive map of the trails at Upper Paugussett State Forest, check out the page on TrailForks.com.